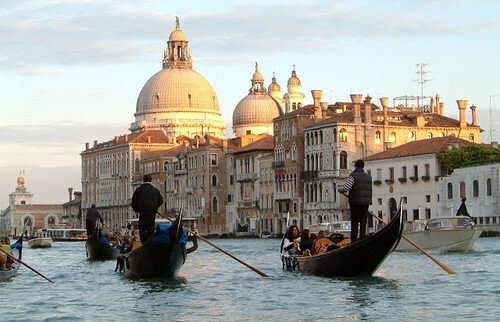 Venice is a city in Italy on the banks of the Po and Piave Rivers. The city is renowned for its canals, bridges, beautiful setting, architecture, and artwork. The city and its lagoon are listed as Unesco World Heritage Sites and is known as the Queen of the Adriatic. Its beauty makes it one of the most demanded tourist destinations in the world and visitors can embark on a Grand Tour which takes them through cityscape, musical heritage and culture. One of the most famous aspects of the city is being able to take a tour through the canals on a gondola. The city also hosts several international conferences and festivals as well as the Carnival of Venice annually. The Venice Film Festival is world renowned; other attractions include St. Mark’s Basilica, Doge’s Palace, Ca’ d’Oro, Grand Canal, Piazza San Marco, and Lido di Venezia. Music is also very important to the culture of Venice as is food which relies heavily on seafood. Risi e bisi, fegato alla veneziana and risotto with cuttlefish are a must try. For food try La Cantina and for bacari try the Alla Vedova. The city has a humid subtropical climate with cool winters and very warm summers and is served by the Marco Polo International Airport.